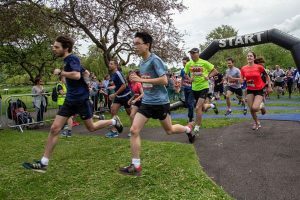 Challenging 5k & 10k races through the countryside and around Godalming in the heart of the Surrey Hills, including a section through the grounds of Charterhouse public school, so picture postcard stuff, plus there is a great 1k Fun Run for the kids. The Godalming run was first established as part of the Queen’s Diamond Jubilee celebrations in 2012 and to celebrate the London Olympics. Since then we have attracted thousands of entrants and have raised over £17,000 for the Sport Godalming Champions Fund, Go for Gold, which supports local Godalming-based athletes in their bid for Olympic stardom.